For courses in world regional geography. This package includes Mastering Geography . This contemporary approach to World Regional Geography introduces the latest ideas, concepts, and theories in geography while also developing a strong foundation in the fundamentals of world regions. It conveys a strong sense of place and an understanding of the connections within and between world regions. 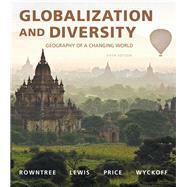 Globalization and Diversity focuses on the core materials that readers need to know. The 5th Edition features new content on everyday globalization, and the tools, skills, and applied approach of contemporary geography, along with Mastering Geography with MapMaster™ NextGen interactive maps, new video resources, animations, and author blogs. Mastering™ Geography is an online homework, tutorial, and assessment product proven to improve results by helping students quickly master world regional geography concepts. Students benefit from self-paced coaching activities that feature personalized wrong-answer feedback and hints that emulate the office-hour experience and help keep students on track. With a wide range of interactive, engaging, and assignable activities, students are encouraged to actively learn and retain tough course concepts. Globalization and Diversity , 5th Edition is also available via Pearson eText, a simple-to-use, mobile, personalized reading experience that lets instructors connect with and motivate students — right in their eTextbook. Learn more. Les Rowntree is a Visiting Scholar at the University of California, Berkeley, where he researches and writes about environmental issues. This career change comes after three decades of teaching both Geography and Environmental Studies at San Jose State University in California. As an environmental geographer, Dr. Rowntree’s interests focus on international environmental issues, biodiversity conservation, and human-caused global change. He sees world regional geography as a way to engage and inform students by giving them the conceptual tools needed to critically assess global issues. Dr. Rowntree has done research in Iceland, Alaska, Morocco, Mexico, Australia, and Europe, as well as in his native California. Current writing projects include a book on the natural history of California’s coast, as well as textbooks in geography and environmental science. Martin Lewis is a Senior Lecturer in History at Stanford University. He has conducted extensive research on environmental geography in the Philippines and on the intellectual history of global geography. His publications include Wagering the Land: Ritual, Capital, and Environmental Degradation in the Cordillera of Northern Luzon, 1900—1986 (1992), and, with Karen Wigen, The Myth of Continents: A Critique of Metageography (1997). Dr. Lewis has traveled extensively in East, South, and Southeast Asia. His current research focuses on the geographical dimensions of globalization. In April 2009, Dr. Lewis was recognized by Time Magazine, as a favorite lecturer. Marie Price is a Professor of Geography and International Affairs at George Washington University. A Latin American specialist, Marie has conducted research in Belize, Mexico, Venezuela, Cuba, and Bolivia. She has also traveled widely throughout Latin America and Sub-Saharan Africa. Her studies have explored human migration, natural resource use, environmental conservation, and regional development. She is a non-resident fellow of the Migration Policy Institute, a non-partisan think tank that focuses on immigration. Dr. Price brings to Globalization and Diversity a special interest in regions as dynamic spatial constructs that are shaped over time through both global and local forces. Her publications include the co-edited book, Migrants to the Metropolis: The Rise of Immigrant Gateway Cities (2008, Syracuse University Press) and numerous academic articles and book chapters. Bill Wyckoff is a geographer in the Department of Earth Sciences at Montana State University specializing in the cultural and historical geography of North America. He has written and co-edited several books on North American settlement geography, including The Developer’s Frontier: The Making of the Western New York Landscape (1988), The Mountainous West: Explorations in Historical Geography (1995) (with Lary M. Dilsaver), Creating Colorado: The Making of a Western American Landscape 1860—1940 (1999), and On the Road Again: Montana’s Changing Landscape (2006), and How to Read The American West (2014). In 2003, he received Montana State’s Cox Family Fund for Excellence Faculty Award for Teaching and Scholarship. A World Regional Geography instructor for 27 years, Dr. Wyckoff emphasizes the connections between the everyday lives of his students and the larger global geographies that surround them and increasingly shape their future.